When traveling, I usually have a clear idea of where I’m going, but I like to improvise on the road. This time, my plan was to see the antique houses of Shirakawa-go up in Gifu Prefecture. Located at the foot of Mt. Hakusan in the northwestern part of Gifu, the quiet village of Shirakawa-go is surrounded by mountains and dot­ted with rice fields. This little town sounded like a great destination for a short trip. To get to Shirakawa-go, I hopped on my trusty Hon­da CB 1000 T2 and used the Chuo Highway, getting off at the exit for Matsumoto. From there I took road 158 to get to Takayama, which turned out to be one of the little treasures I hadn’t planned for. I was delighted to find that the city is an old castle town built in the 16th century. The castle is long gone and only a few ruins remain, but the remote location made the town feel straight out of an old samurai movie, especially when I saw a rickshaw with two ladies dressed in kimono si­lently gliding through the street, in stark contrast to my noisy Honda. I soon realized that I wanted to know more about this little town, so I decided to find a place to stay overnight. The next morning, I started off towards Shirakawa-go, but the weather soon started to turn. I began looking for a ryokan to save me from the rain. After a few kilom­eters, I found a nice place that even offered an omen. I don’t mind riding in the rain, but given the choice, I prefer to get wet in a hot bath. The landlady was very kind, and there were plenty of rooms available. As the sound of heavy rain woke me, I chose to stay another day and wait for it to stop. Sure enough, by early afternoon most of the clouds had cleared. My landlady suggested I explore the area around her ryokan. My touring map suggested a small forest road, No. 451, leading to Shiramizu Waterfall, and on the road I found a delightfully hot little onsen, costing only ¥200. With no other visitors around, I had these gems completely for myself. The next morning, a blue sky was awaiting, and I eagerly got back on the road to see Shirakawa-go. And it was worth the wait. The houses are built in the gassho-zukuri style, with the unique thatched roofs typi­cal of the area. Gassho means “praying hands,” perfectly describing the shape of the roofs. 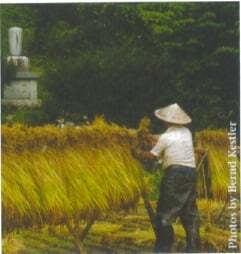 In 1995, the villages of Shirakawa-go and nearby Gokayama were listed as World Heritage Sites. One architect described the hous­es as the best in the world — perfectly adapted for the people living and working in this area and climate. The beam structure is built to suit the harsh environment of heavy snowfall in winter, strong rain in spring, and hot temperatures in summer. To minimize wind resistance, the houses are lined up from north to south. This helps keep the rooms cool in summer and warm in winter. A roof lasts for an amazing 40-50 years, after which rethatching is necessary. Driving through the village I could see houses of var­ious ages, some very old, with green moss covering their roofs. Others seemed to have been re-thatched recently, and one was currently under construction. As it was har­vest time, people were busy with cutting and bundling rice, and hanging the bundles up to dry. Still, they were always happy to indulge me in some small talk. Later in the afternoon I got ready to head back to Tokyo. Getting on my bike I was doing a U-turn when it happened. The wheels hit some loose ground and my Honda started to tip slowly over. What a way to end a great trip. I tried several times to pick up my bike, but at 245kg, I wasn’t having much luck. After about 30 min­utes I saw a car coming. A young couple from Shirakawa-go noticed my problem and stopped. The husband and I managed, with some encouragement from his wife, to put my Honda back on its wheels. After a cup of local green tea together, I was on my way home.